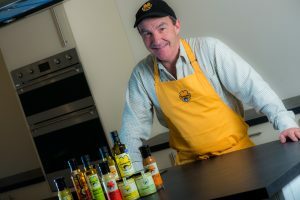 Fussels Fine Foods (based in Rode, a village not far from Frome) has been established since 2005 and specialises in a range of rapeseed oil produce – which is locally grown. The founder of the business Andy Fussel oversees the whole process, from seeding the plants to the bottling of the oil. Fussels Fine Food is branching out, creating a forum; an exciting new food and community initiative. It will be offering a full programme of food related activities, including: demonstrations; master classes; social evenings; cooking for children; family days on the farm, and much more. A dedicated demonstration kitchen will see a number of exciting chefs and food experts displaying and sharing their skills and passions for great ingredients and fantastic food. This kitchen venue is set to be opened on 30 June by the well-known television Chef Lesley Waters. Andy Fussel will also be showing people around the new site and explaining the field to bottle process that creates his single cold pressed extra virgin rapeseed, including a demonstration of the new press, filter system, filler and labeller that have just been installed. An open day on 24 July, 10am – 4pm will show attendees round the site, with opportunity for asking questions on how the farm grows, presses and bottles their award winning oils (2 golds and a silver at the recent Taste of The West Awards). The open day is free to attend, open to all and suitable for all ages, with drinks and nibbles on hand – as well as the chance to have a close-up look at their monster tractors and combines.